The best driving game of the year awaits you.The beginning ofarealistic driving experience is extreme Doblo.Free and3Dgame.Realistic maps.There's no time limit.Do you like to playgameswithout being bored for hours?It's Time!We are developing amobilegame to provide the best experience for our users.Realisticvehiclecontrol and driving physics.Unique UI interface andbuttons.Alsomenu UI color options.Over-turbo Doblo. Driving in thecity 2018.Toensure the best driving experience, we've done thisgame.Myth gamewith extreme turbo Doblo.Forward or backwardABS,ESP,nitro 6different camera modes,air suspension,gear option D& R.Greatturbo Doblo is waiting for you.Some features of thecity in Doblodriving game 2018-best car racing-Race,arcade,drift,inupiakoptions.-As a driving assistant,such asABS, ESP and TCS.-Realistic tool physics,audio and video effects.-There's no timelimit.It's an endless game.-Different cameraangles.-Differenturban models- Large UI buttons and indicatorsEnjoyyourselves. Each other great Indian production cars now driving moreenjoyable.3-dimensional sound and picture quality for you to enjoywith a drift game.do the model walk in the city with Tata Nano inIndia.Telcoline 4x4 climb mountains.Driving simulation withindica.Models of big city streets and roam freely within.A uniquegame with great Indian Tata Nano car is waiting for you.Realisticvehicle physics.Real mobile game controls.Easy to use thanks to thebuttons on the screen.Different camera angles.Game modes andmore.Now go ahead and awaits you with the Tata Nano.Tata Nano,Indica, Telcoline drift Prado. 3-dimensional sound and image quality with a fun-filled excitingdrift simulation game.Now one of the newest sports cars 2017 greatvehicle, realistic vehicle physics and controls in this game.Carsimulation game.Car racing realistic drift mode with drift, orarbitrary age.Want to right-check with the left button.Drift withthe steering wheel like on the streets.If you want to drive yourcar by checking with the sensor.Driving a car in the city with anew sports car case starts.508 rcz is a candidate for being amongthe best of free 3d games 2017.508 rcz sport car simulator 3D greatfree.Big city roads and streets to travel freely between thebuildings and drift in the model simulation.Wanna drift if you wantto have a fun time with 3D 508 rcz by the park.3 different playingoptions.Push-button sensor, and steering.You can make easily with adifferent camera angle Park and 3 turns.There is no limit of timeand it's free.New free car racing game drift 2017Yellow Rcz 508with enjoyable 3d game.The game is completely free and you will getpleasure from plenty of options in 2017.3d 508 Rcz drive thestreets like crazy drift and burn rubber.There is no limit oftime.4 different map.Realistic models.Realistic vehicle physics andcontrols, realistic vehicle is waiting for you.Camera with theoption of 3 different park,simulation,drift and you can race.One ofthe best cars in Europe.The world's best cities.Start the engineand start driving with start stop option.Realistic speedindicators.R & D Manual and automatic transmission options. Exciting simulation game with realistic sound and image quality isa combination of drift.Great sports car models from each other.F40,Audi R8,Corvette choose your car and start playingimmediately.Different game modes.Drift,simulation,parking,freemovement.Comfortable with different modes of camera view.With thecolors is an exciting game.Realistic vehicle controls.Realisticvehicle physics.The drift physics.Great features mechanicalsuspension.There is no limit of time.Play as youwish.Easy-to-use.Button,sensor,steering, a great car to simulatedrift.Luxury cars racing with excitement waiting for you.PradoCorvette F40 R8 is waiting for you.In the model the dust in thestreets and alleys of the big city is the floor. One of the most popular games in 2017.prado, great vehicle sportscar now, realistic vehicle physics and controls in this game.Carsimulation game.Car racing realistic drift mode with drift, orarbitrary age.Want to right-check with the left button.Drift withthe steering wheel like on the streets.If you want to drive yourcar by checking with the sensor.Old safe driving a car with asports car in the city starts.There is no limit of time.4 differentmap.Realistic models.Realistic vehicle physics and controls,realistic vehicle is waiting for you.Camera with the option of 3different park,simulation,drift and you can race.One of the bestcars in Europe.The world's best cities.Start the engine and startdriving with start stop option.Realistic speed indicators.R & DManual and automatic transmission options.Among the best games of2017.Realistic sound and image quality.HD quality.Download and playfree now.Suggest to your friends. Use the buttons on the screen and this is a great helicopter tofly.Left to right, back and forth with options for an enjoyablegame.Snowy mountain on a helicopter and be a pilot you have to.Freeflight simulator.Immediately play.Realistic army militaryhelicopter simulation game.3-dimensional sound and imagequality.Realistic sound effects.Use helicopters in themountains.Realistic be a helicopter pilot.The helicopterfly.Control is in your hands.Realistic physics controls.You flywith a helicopter in the mountains.Realistic Helicopterphysics.Instant play free download. You have to check out the physics of Cars different from each otherprado is waiting for you.Every model of Alfa Romeo great cars inthis gameBest trend of the year will be on roads and tough terrainin this game and the game starts with Romeo driving in thecity.Great Italian cars.145 146 147 155 156 159 MitoGiulietta.Enjoy comfortable use with 3 different camera modesrealistic physics.Alfa Romeo prado with audio and video effects,take the option and use it.Free 3D game you can download.If youwant to climb mountains walking through the forest away from thecity.Realistic vehicle physics.Free 3D car game.Drift racingphysics and simulation controls.It's an exciting game with uniqueinterface and UI s buttons on the screen.You want to park the caror simulation or arbitrary drift. Furious Car Driving 2017 is an advanced driving simulator withrealistic physics for both sport and an off-road car.There are 8Furious cars that are fully controllable and you can modify frontand rear suspensions, camber, suspensions spring force and damp.Youcan turn on or off the steering assistances such as ABS (Anti-lockBraking System), ESP (Electronic Stability Program), TCS (TractionControl System) and SH (Steering Helper).You can also adjust theMaximum Speed, Maximum Brake and Maximum Torque of each super fastcar!Choose the traction type that you like: front wheel drive(FWD), rear wheel drive (RWD) or all-wheel-drive (AWD) and take thecars off-road for an excitement ride. An off-road car for drivingon hills and to simulate 4x4 traction. You can call this game anextreme car simulator or extreme furious car driving and you won'tbe wrong. Choose what kind of transmission you like: manual orauto.Get on the highway and use the nitro to drive as fast and asfurious as you can in 8 super cars! Enjoy the advanced physicsengine with incredible physics behaviour and graphics. Drive withyour car in different styles including drift mode that enables thecar to drift using the hand break. All vehicles driving game meansyou can drive a Bus, a Van, a Truck with trailer or without atrailer, a desert buggy, a SUV or a Sedan. Furious car racing is agreat way to spend some time gaming and driving a super car.If youlike car driving games with cars that crush, get damage and amazingdrifting try this free car driving simulator game! Race fast, driveFurious! 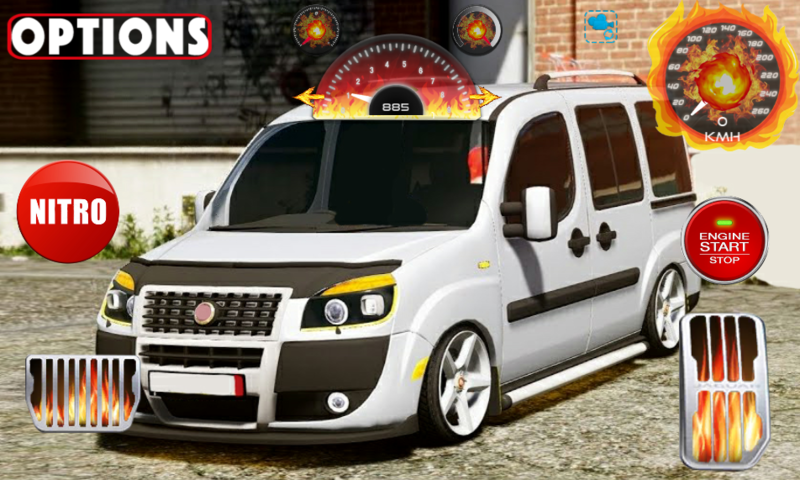 Top Features- Over 22 vehicles available!- Incrediblevehicles- Full HD graphics- HUD Camera- Realistic sounds-Controllable car behavior: simulator, racing, arcade, drift, funand custom.- Realistic physics- offline game- free game withoutwifiMobimi Games develops offline games for free for kids (boy andgirls). Enjoy our free games that don't need wifi and don't forgetto leave us some feedback so we can upgrade our games! Have fun! In Impossible Tracks - Ultimate Car Driving Simulator, amazing carsare waiting to be driven around for a talented driver. There aremany obstacles and the paths are quite challenging. Will you beable to take up the ultimate racing challenge? So get into the car,hold the steering and enjoy most realistic cockpit drivingexperience. Drive safely on curvy and dangerous hilly roads. Be thebest car driver in the world and become the king of the road!Complete all the missions given to you in time. Choose from avariety of sports cars to zoom on these speeding paths. ImpossibleTracks - Ultimate Car Driving Simulator is a car racing simulatorthat delivers an exciting driving experience that will make youfeel like a super racer. All you have to do is focus, stay on thesame track and reach the destination before you run out of time.Driving a speeding racer vehicle can be difficult, will you be ableto finish all the missions given to you? The race track is trickyand ready to keep you playing and addicted for hours. What are youwaiting for? Ready, Set, Go! Impossible Tracks - Ultimate CarDriving Simulator Game Features: 1. Awesome quality HD graphics. 2.Loads of challenging missions. 3. Amazing super speed cars toupgrade. 4. Realistic truck physics. 5. Addictive game play withlots of fun. The best classic car driving simulator game of 2018 comes with themost realistic driving physics, unlimited customization, huge openworld, addictive gameplay and endless fun!★REAL DRIVINGPHYSICSUltimate Car Driving: Classics combines the realism and fundriving physics to create the best car driving simulator on mobilewith its advanced car driving physics engine. The best car drivingsimulator comes with the best driving physics! From racing cars tooff road SUVs, all kinds of vehicles have their ownphysics!★UNLIMITED CUSTOMIZATIONCreate your own car and show offyour style to everyone! From countless vinyls to car parts, you cancreate your own dream car with this game. Imagination is your onlylimit! Extreme customization is waiting for you!★OPEN WORLD MAPThehuge open world map is designed in a creative way to test yourextreme car driving skills and provide the best gameplayexperience. From cities to deserts, Ultimate Car Driving Simulator:Classics comes with the largest open world map with extremelydetailed environment. Drive on the endless offroad area with yourSUV and experience the most realistic offroad driving experience onmobile.★THE BEST SOUND EFFECTSAll the sounds are recorded from realcars to provide the strongest feeling to the player. From thestrongest racing car sound to the burning offroad engines, everycar has their own special sound recorded from real racing cars!★THEBEST GRAPHICSWith the help of advanced graphics engine, UltimateSimulator now provides the most realistic graphics and deepest 3Dever on mobile. You will have a hard time distinguishing yourextreme cars from the reality!★COUNTLESS CARSFrom hot rods toclassic racing cars, all kinds of classic cars are here for you.Pick your favourite classic car and do whatever you want to do in agiant open world map!Ultimate Car Driving Simulator will be updatedregularly with your suggestions. Don't forget to leave a reviewwith your feedback.Follow the community on Facebookathttps://www.facebook.com/speedlegendsgame/or Twitterathttps://twitter.com/speed_legendsDownload the best classic cardriving game of 2018 now! Drive to survive and destroy the other cars in the most mad carride of your life! Do you enjoy physics based driving games? Howabout extreme car driving simulators or off road games with carsand 4x4 trucks? Car destroying games? Mad racing games withupgrades? If so then you’re going to love Car Eats Car! In thissuper-fast and fun racing game you’re going to have to take on theother vehicles on the road who are just waiting to destroy you! Youcan collect and earn upgrades and shoot your enemies or you cansimply put your pedal to the metal and out-race them! But wait. Youdidn’t think it was that simple did you? You can also earn extrapoints by using the hills to jump and pull off awesome mad stunts!FEATURES LIST • Outrun the other fast cars who are trying to devouryou! • Collect nitro and other upgrades to increase your max speed!• Perform flips to become the most accomplished stunt car on thestreet! • Burn some rubber and try not to die in the mostaggressive uphill racer! If you like max nitro games then youalready know that you’re going to love this insane free racinggame. Remember: only the strongest will survive so destroy the carsand leave them choking on your dust in order to succeed! Play thebaddest, fastest car game for kids on the net! Drivers… start yourengines!